This elaborately decorated wax disc is known as the ‘Seal of God’. Dating from the 16th century, it originally belonged to the Dr John Dee, a prominent English mathematician and sometimes adviser to Queen Elizabeth I. Dee was also keenly interested in the occult and this wax seal acted as a pedestal upon which he placed his ‘shew-stone’, a crystal ball used for ‘scrying‘ (spiritual visions). Indeed, Dee spent much of his later life trying to commune with angels, often in tandem with Edward Kelley, a self-confessed medium. Kelley claimed he could see angels in the ‘shew stones’ and these communicated with him by pointing at tables which contained words and symbols. According to Dee these messages were delivered in Enochian, an angelic language that he subsequently transcribed into a series of books. 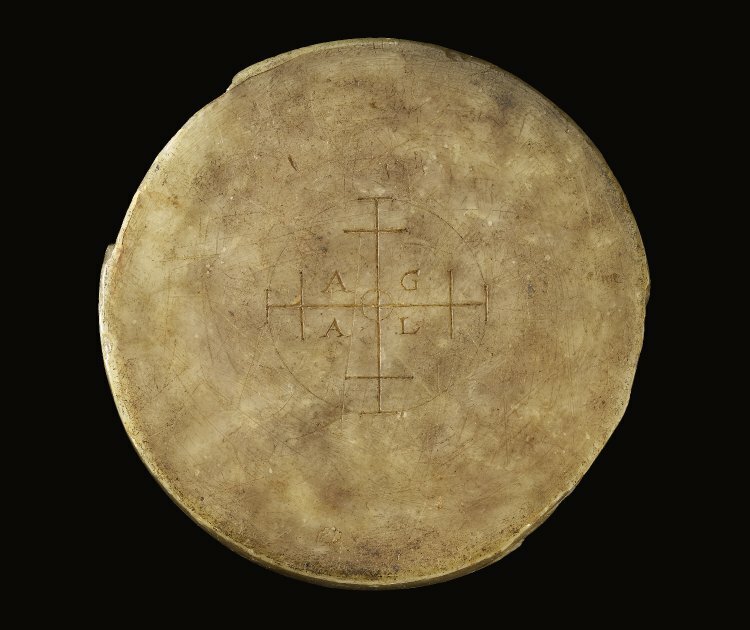 The wax disc appears to have played an important role in these séances and it is engraved with magical words and diagrams that were believed to give it supernatural powers. It measures circa 23 cm in diameter by 3.5 cm deep and also contains decorative motifs on its reverse (see below). 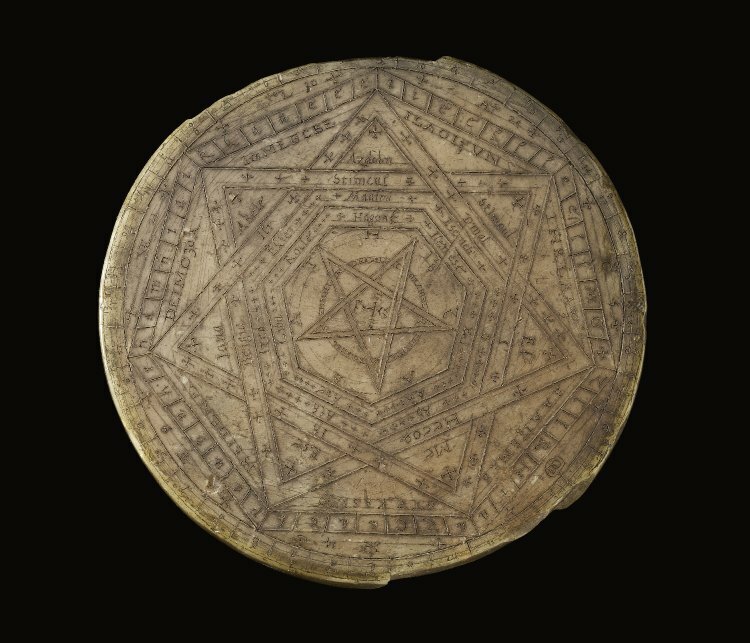 An interesting piece of occult paraphernalia, the disc now forms part of the British Museum‘s collections. Do you realize how oddly this connects to the foundation story of the Mormon church (LatterDay Saints)? I live about 7 miles from where the religion started in America. Joseph Smith was a magician of sorts who used seer’s stones, popular in the 19th century. His parents belonged to different Protestant churches and their ministers each claimed his own was the true church. Smith felt troubled and confused. One day while he was out on a wooded hillside an angel appeared to him, telling Smith none of the churches were “true.” Eventually, Smith declared that Angel Moroni presented him with golden plates on which was written a story which Smith could read only by looking at them through his seer’s stones. He said that he had translated a sacred text called the Book of Mormon. You’ve blown my mind with the story of this disk. The Smith family were descended from English settlers. I wonder now if the practices associated with the disk were part of a very old English tradition which crossed the Atlantic with pioneers who came to northeastern North America in the 17th and 18th centuries. If Smith knew something of that tradition he may have used it when creating his new church. This is an astonishing discovery to me. I wish I knew a scholar who could verify whether I am on the right track, or whether the similarlarities are coincidental. John smith was a drunk and a fraud. What type of wax is it ? Doesn’t it scratch easily ? How thick is it ? Could it get rancid if gouged ? Thank you .